It’s been almost 3 years since I last made any mooncakes! I don’t remember why I didn’t make any in 2014, but in 2015, I didn’t because of the lack of mooncake ingredients and I left my mooncake moulds back in Singapore. When I went back to Singapore in June, I picked up a packet of kou fen (cooked glutinous rice flour) and white lotus paste from the baking shop and brought my mooncake moulds back here with me. My friends and I got together a few days back and made the Chocolate Snow Skin Mooncakes (without the truffle center) that I posted in 2013 and I thought – maybe it’s time I post a new one on the blog! Luckily I managed to make and blog about these Matcha Snow Skin Mooncakes before the Mid-Autumn Festival! It’s very easy to make snow skin mooncakes if you have kou fen and store-bought filling on hand. Kou fen is actually cooked glutinous rice flour, which can actually be homemade by steaming glutinous rice flour (I found a simple recipe here), if you can’t find any in your local baking stores. 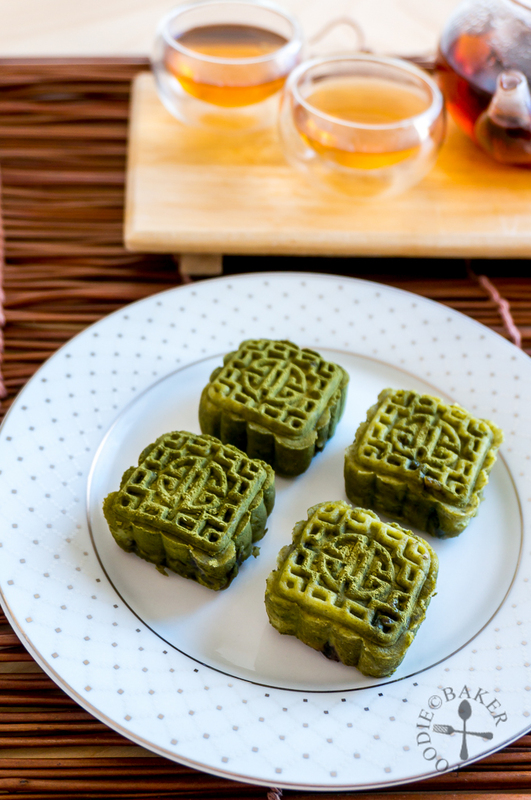 Store-bought filling saves time and trouble – in Singapore, it’s easy to obtain a wide variety of mooncake fillings like chocolate, pandan, coffee, durian etc. The only downside is that they are usually packed in 1-kilogram portions so you will need to share with friends, make a big batch of mooncakes or find alternative recipes to use up the mooncake filling. 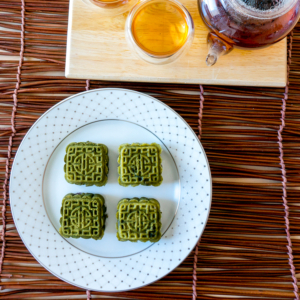 Matcha and red bean belong together so instead of using the store-bought white lotus paste that I brought back, I chose to use my homemade red bean paste for these matcha snow skin mooncakes. I used a Japanese-style red bean paste, which was actually a tad too moist and soft for these matcha snow skin mooncakes, so I had to freeze the red bean paste for a few hours to make them easier to wrap up with the matcha snow skin. Best enjoyed with a cup of Chinese tea! Nevertheless, I still love how these Matcha Snow Skin Mooncakes turned out in the end – matcha and red bean pairing can never go wrong! The fizzy Sprite that I used in the mooncakes will help to keep the skin soft, so I can slowly savour them over the next few days. If you’d like to see the step-by-step photos on how to make the mooncake snow skin, check them out in this Baileys Chocolate Snow Skin Mooncakes recipe! Here’s to a happy Mid-Autumn Festival! Store-bought red bean paste: Divide red bean paste into 17 approximately 30-gram balls. Chill in the refrigerator while you make the Skin. Homemade red bean paste: Divide red bean paste into 30-gram balls. If the texture of your red bean paste is not as firm as store-bought red bean paste, freeze for at least 1 hour to firm up the red bean paste. Sift the kou fen, icing sugar and matcha powder into a large mixing bowl. Add in cold butter (or shortening) and rub it in with your finger tips until small lumps of butter (or shortening) remain. Add in ice cream soda (or whatever fizzy drink you are using) and mix to form a soft dough. Knead the dough in the mixing bowl until smooth. Divide into 17 20-gram pieces and cover with a plastic wrap or tea towel when not in use. Dust your hand with matcha powder. Take a portion of the skin, flatten it, and wrap the filling inside. If you are using frozen homemade red bean paste, wrap all the red bean paste with the matcha skin first before stamping it so that there's time for the red bean paste to soften. 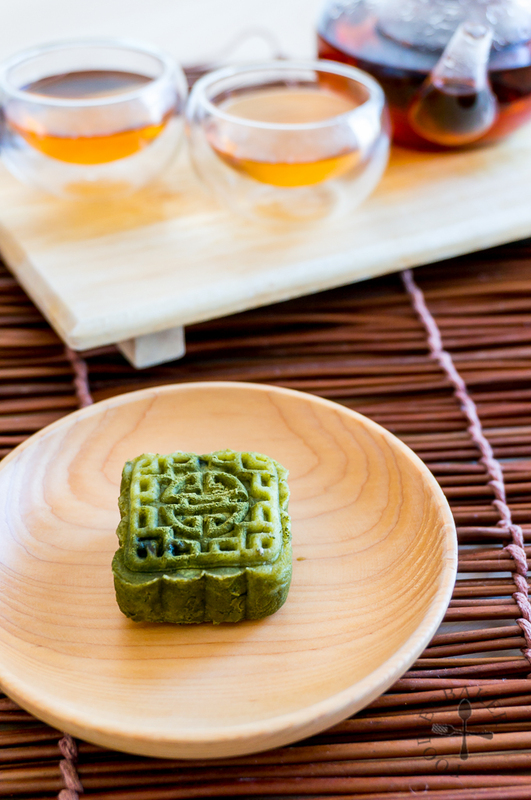 Dust your mould with more matcha powder and place the mooncake inside. Stamp it and push it out onto a tray. Once all the mooncakes have been shaped, place the tray of mooncakes in the refrigerator to firm up a little, about 15 to 30 minutes, so that they don't go out of shape when transferred into boxes. Transfer the mooncakes into an air-tight container. Place a paper towel over the top before replacing the lid to prevent water from forming on top of the lid and dripping back onto the mooncakes. Refrigerate the mooncakes at least 6 hours or overnight before serving. The mooncakes can keep for up to 3 to 4 days in the refrigerator before the skin starts to dry out. 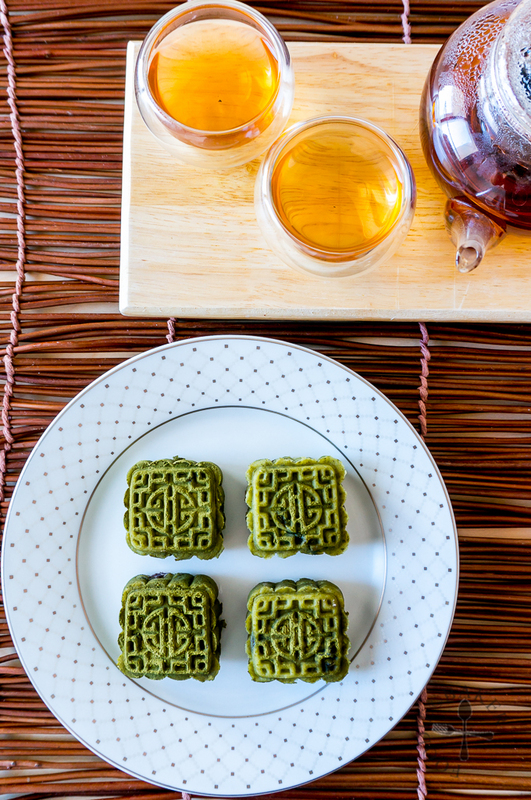 The mooncakes are best served chilled with a cup of hot Chinese tea. - The ice cream soda / sprite / 7-up is the secret ingredient that helps keep the snow skin soft for days! Thank you for your recipe. It’s so easy to follow. Hahah I want to be your neighbour too! We could potluck everyday! These matcha mooncakes are absolutely beautiful !! Yes, I’m all for matcha and red bean pairing! Such an awesome combination. And I am always so amazed and impressed by anyone attempting mooncakes at home. This is a beautiful example. Happy Mid-Autumn Festival to you Jasline! 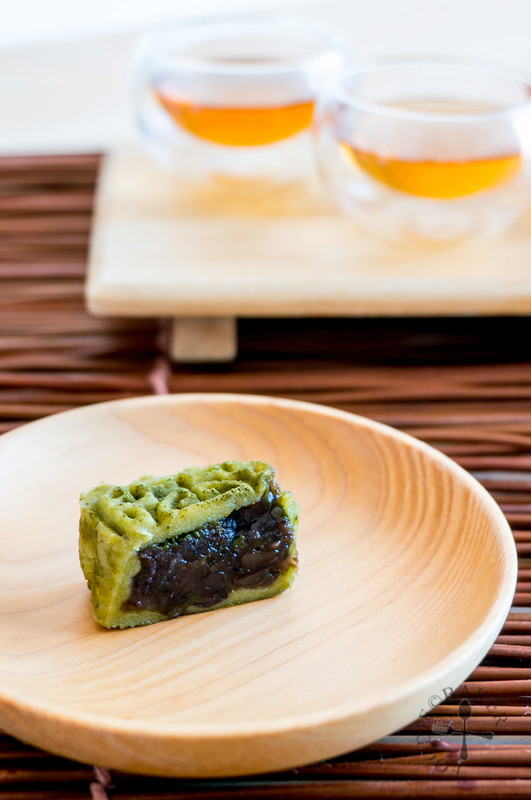 I adore matcha and azuki red beans are in my book much better than traditional lotus with egg filling. I know I am completely bummed because for some reason I have lost my moon cake moulds…I might have to resort to amazon prime to sort that out so that I can make your delicious mooncakes. Sharing everywhere! Hi Bobbi sorry this comment went into spam I don’t know why and I just found out! I actually got my mooncakes from ebay at a very reasonable price. Maybe you can try getting it from there! these are perfect! So pretty and chic.